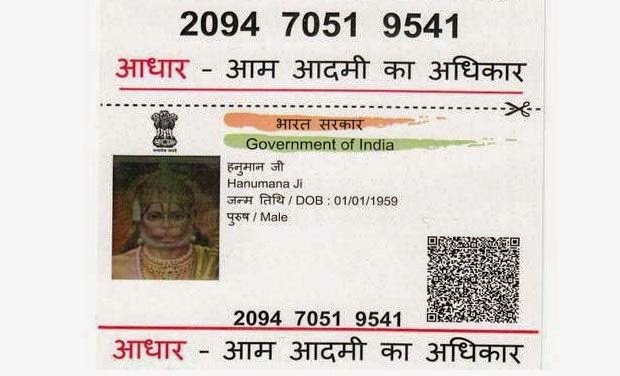 Following reports that an Aadhaar card was issued in the name of Hindu deity Hanuman in Sikar, Rajasthan, the Unique Identification Authority of India (UIDAI) has termed the incident an “exceptional case”. Vijay Madan, director general, UIDAI, said the agency’s enrollment process was robust. “We have an accuracy rate of 99.9 per cent, and this incident accounts for less than .1 per cent of the cases which slip through the system.” Since the population is so huge, when the absolute number of such cases adds up, it seems huge, Madan said. It was reported this week that an Aadhaar card has been issued in the name of Lord Hanuman. The card, with number 2094705195411, bears a picture of the Hindu god, and mentions him as the son of ‘Pawan’, besides giving a mobile number and a thumbprint. Since the postman was unable to deliver the card, which was dispatched from Bangalore on September 6, it will be returned. Madan said the agency had a set some rules to deal with such cases, which includes blacklisting the agency or registration of a criminal case if the mistake was found to be intentional. The agency involved in the incident has been removed, said another UIDAI official. The enrolment process of the agency has come under fire several times for being lax, especially from the home ministry. Three years ago, around 30,000 fake identities were created in Hyderabad. However, UIDAI has maintained that such instances are rare and it has deployed measures that continuously clean its databases of fakes and duplicates.